Cold adhesion labels not only bond in freezing temperatures, but they also withstand temperatures below zero. Feel confident your message and important information won't fall off or get lost in the coldest termperatures. 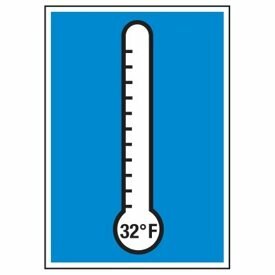 These cold-adhesion labels are ideal for placing on items during transit in cold temperatures. Constructed for use in low termperature areas such as freezer, coolers and unheated warehouses, these labels are well suited for food and healthcare industries, manufacturing and storage facilities. Made of self adhesive paper, these labels bond to surfaces in temperatures as low as 0F and stay secure from -40°F to 176°F. We offer a variety of cold labels to choose from, including Quality Control Dots on a roll with messages such as, "Ok to Use," "Inspected," "Date Received," "Use First," and much more. Cold adhesion labels offer the perfect solution to help organize areas that experience chilly temperatures. These adhesive labels can be applied to areas that face freezing conditions and can even create a firm bond in temperatures as low as 0°F. These labels are guaranteed to stick in temperatures ranging from -40°F up to 176°F. Use a cold adhesion label in a freezer, outdoor storage area, or even in an unheated warehouse to maintain organization and to help communicate important safety information. We offer many different types of cold adhesive labels, including cold adhesion safety labels with messages such as "Exit," "Danger Confined Space," "Cold Area No Prolonged Exposure," and much more. If you need a solution to assist in inventory and organization, look no further than our selection of roll form labels. If you can't find exactly what you want, create a Custom Cold Adhesion Roll Form Label; choose from among 14 background colors, select black or white font, add your specific message and you're done.